Even though he probably drew inspiration from plenty of other dark ambient and dungeon synth releases, I like to imagine that Dark Ages exists because Roman Saenko woke up one day and said, “You know, I wish the Burzum album Dauði Baldrs was good,” before following that thought up a moment later with, “Wait a minute. Maybe I can make a better Dauði Baldrs myself. My main band is the second band that comes up when you click the 'similar artists' tab on Burzum's Metal Archives page anyway so why not give it a shot?” The second album from Saenko's dark ambient side project, though its similarities with Dauði Baldrs can't be denied, the album stands far apart from Varg's controversial first full-on foray into ambient music, delivering a tone that remains crushingly bleak and sorrowful and stays engrossing almost all the way through. Whereas Dauði Baldrs evoked multiple moods in what is essentially a conceptual story made out of several tone poems, A Chronicle of the Plague is always slightly less cheerful than The Pianist. Saenko must really be commended for weaponizing human sadness and anxiety so effectively. He finds several ways to cultivate the dread this project is all about. In this regard, 'Rats' is the most notable number, breaking up its atmosphere, while somehow augmenting it, with a loud, frightening crash of dissonant keyboard notes every few seconds. 'Ships Full of Blackened Corpses' is perhaps the best album opener possible for a release like this, kicking things off with a continuous stream of a church bell tolling ominously in the background while long, uneasy synth swells replicate the feeling of sailing across a bay as still and rotten as a corpse while the coastline burns behind you. ‘Blessed be the Waters of the Avignon River’ manages to make tinkling keys sound sinister while ‘Black Death’ delivers similar keys as well as something that sounds like the Grim Reaper sawing the album’s most haunting and memorable melody on his cello (or his keyboard, utilizing a tone that sounds vaguely like a cello). Though this album is much more limited in the emotional tones it seeks to deliver and its songs arguably more repetitive than the ones in Dauði Baldrs, it never gets stale. While Saenko is just as dedicated to hypnotically repetitive atmosphere as Varg, he seems to have a better understanding of when enough is enough. The longest song on this album is just shy of the seven-minute mark and the album wraps up in just over half an hour, meaning you won't be bored stiff by the same three notes being played for 11 minutes, like 'Illa tiðandi'. While these songs are made up of one stretched-out idea apiece (except 'Black Death', which switches from the sparse keys to the faux cello), they aren't allowed to linger to the point where keeping your finger away from the skip button becomes a test of strength. Saenko, it should be noted, had much better equipment than Varg did and uses it effectively, never allowing any tinny or plasticky tones to slip in and hamper the mood. When Chronicle gets to ‘Dead Desolate Villages’, the sixth and penultimate track, the album falters. Saenko seems to have run out of ideas here. At this point, he resorts to continuous droning that sounds ominous but doesn’t present any sort of melody or progression worth remembering. The same is true of album closer ‘Dreams in Yellow’ except this one is made up of droning effects that, in the vaguest possible way, sound kind of like distant Gregorian chants. These songs are competent continuations of Saenko’s make-my-listeners-as-miserable-as-possible strategy but they don’t approach the task with any innovation or interesting musical ideas. A Chronicle of the Plague is a masterful slab of minimalistic, eerie ambience. Saenko knew exactly what he needed to do to instill the most dread in listeners with the least amount of trappings. Though most of these songs stand apart from each other, they're all effective in building a tense, gloomy atmosphere. Not the kind of thing anyone would get turnt to at a party, Chronicle is exactly what you need if you've got a craving that only dark, dismal ambience can satisfy. Roman Saenko follows up last years debut release "Twilight Of Europe" with this fine piece of dark-ambience again looking towards that period of the 14th century. 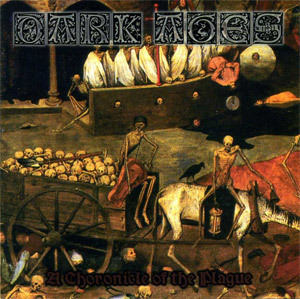 However, whilst that album focused on several different aspects to that dark period of history (ie; the black plague, alchemy, witch hunting etc) "A Chronicle Of The Plague" narrows its vision, instead choosing to focus on (and around) the year 1349 when the black death of Europe invaded and took the lives of many millions of people. Musically "A Chronicle...." follows in a similiar direction to "Twilight..." with minimalist, repetitive, short pieces of dark ambience. However the songs are more melodic and varied this time but are even darker than before. Infact this writer found it far more haunting, sinister and fear inducing than its predecessor. Another improvement on the debut is that whilst "Twilght..." might have felt like a series of intros and outros this record feels more like a whole album. There is even a guitar that makes a very brief appearance in the opening song that gives hints of funeral doom (apparently the original idea behind Dark Ages). It should also be noted that the final track on the album "Dreams In Yellow" brings to mind some of Hate Forest's most ambient moments and it could easily have fiited into the material on Hate Forest's all ambient "Temple Forest" demo. For those out there who already own and like "Twilight Of Europe" or "Temple Forest" then this should hopefully be another satisfactory purchase. All those who enjoy dark ambient music and appreciate it might also do well to check out this release. Far from being anything exceptional but certainly not a waste of time.